Come learn more about The Barn Quilt Heritage Trail – McLean County from president, Kay Henrichs, next Tuesday, February 24 at 6 pm in the library’s community room. She will share how they are celebrating our county’s farming heritage with the talents of local quilters, artists and poets. In 2014, the project came under the sponsorship of University of Illinois Extension in Livingston, McLean and Woodford Counties. Area barns and other buildings are being decorated with 8 x 8-foot quilt squares painted on plywood. Note the newest quilt block addition in our community to the Simpkin’s War Museum on Cole Street. Participating site owners work with the Barn Quilt Committee to select designs and colors for their barn quilts, and some owners have worked on the creation of their own barn quilt blocks. Mark your calendars and join us for an informative evening. Do you have some Lego Maniacs in your life? Send them to the library on every first Tuesday of each month. Join us this upcoming Tuesday, March 3 at 3:45 pm for an hour of fun, building with friends. Blind Date with a Book: Come in and choose a wrapped up book as your “blind date”. Give it a read, then fill out our “Rate Your Date” book mark and return it with the book. The rating slips will be entered into a drawing for one of two library tote bags. We aren’t arranging marriages and not a dime has to be spent! Celebrate Dr. Seuss’s Birthday: Join us this February as we read for prizes! For every book, audiobook, or magazine checked out in February, a ticket will be given to be included in drawings to win one of five Dr. Seuss books donated by our local General Federated Woman’s Club of Heyworth (GFWC). You may choose the book you want to be entered to win. The drawing will be held on March 2, Dr. Seuss’ birthday. Knitting for Beginners, 1st and 3rd Mondays of each month, 6:30 pm – 7:30 pm. We are thrilled to offer beginning knitting! Must sign up to attend, limited space. Available to anyone 4th grade and up. Monday Evening Book Club, 4th Mondays at 6:30 pm. Would you like to start your own book club with a group of friends? We can help with book selection and loan the books you will need for your group. Stop by today and ask for details. Friday Afterschool movies, 3:20 pm every Friday the library is open during the school year. For a listing of titles being shown, please stop by the library for a flyer or check out the program page on the website. Bring your own snack and drinks with a screw cap lid. Heyworth History Club Winter Programs, every 4th Tuesday of the month at 6 pm; we will present a program on local history given in the library. Come learn how local quilters, artists, and poets are celebrating our local farming heritage. Learn more about this fascinating treasure in our backyard from Bill Case, Funk Historian. Heyworth History Club, 4th Wednesday mornings at 10:30 am. All are welcome to join us in collecting and preserving Randolph Township history. Lego Block Party, 1st Tuesday of each month at 3:45 pm. Afterschool snack, Lego games, and creative building. Sign up at the library. 1st grade – 8thgrade. PYSANKY, Ukrainian Egg Decorating Class Free class for a limited number of participants. Instructor: Kara Lopez. Sign up today! Family Movie Night, Join us in the Community Room for a NEW family friendly release, water bottles and popcorn provided. Teen Program: Leary Easy Prom Hairstyles You Can DO YOURSELF! Free class for a limited number of participants, high school age only. 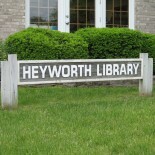 This entry was posted on February 18, 2015 by Heyworth Public Library District.